Really, summer in a glass. 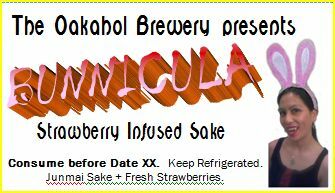 I read this article in the LA Times many years ago, and since then had made this lovely Strawberry-infused Sake so many times, it's become a part of my repertoire. 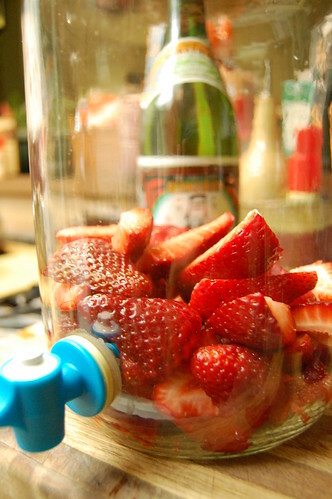 Put it simply, halve 2 pints (baskets) of fresh strawberries (quarter if they're huge). Put it in a sun tea jar. Pour a bottle of cheap regular (junmai) sake over it. Let it sit in a cool dark place--not the fridge!--for 3 days. And voila! On the 4th day, you put the whole jar in the fridge or you can strain out the fruit. 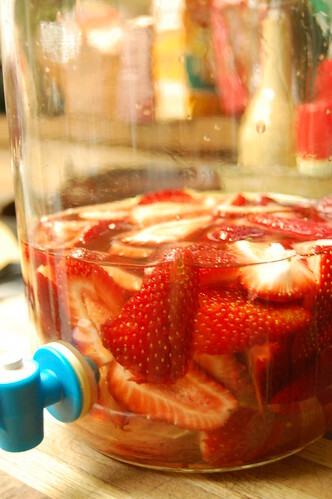 Using a sun tea jar has the advantage of the spout--no straining needed to pour! You might find that the smell and taste of it on the 3rd day may be a little bit on the riper side of the strawberries. Fear not, the taste DOES mellow out once it is chilled. Well, I forgot to take a picture of the jar before I extract the sake to take to a friend's barbecue. 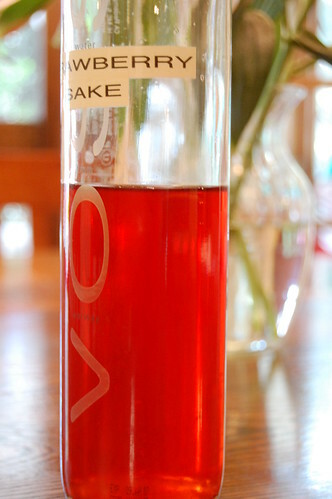 Essentially, the color and juices have come out of the berries and into the sake. The fruit themselves looked like a white sock that has been in a red load of laundry. You know how cheap sake has that bite to it? Well, the berries took in all of that too. A friend of ours decided once to just have the sake soaked berries for dessert. She liked the bitter, you see. Boy, did she get wasted faster than any of us actually drinking the sake! Bottling tip: I have found that Voss premium spring water glass bottle to work beautifully for my transport. As I have found out, you can buy the plastic version of these at retail store in the big liter bottle and the little one. Some of the bars to sell the small bottle ones too. So...if you happen to buy those fancy schmancy water, keep the bottle. I used to buy small bottles and corks from the beer brewing supplier store, slap on my own label and gave them to friends. But if I can find small Voss bottles out there, I don't have to trek to the special store for bottles now. However, I think I'll be paying more for the fancy water. Heh. Hahaha....that's so wrong, the lable. It is considered as moonshine type liquor, I guess.